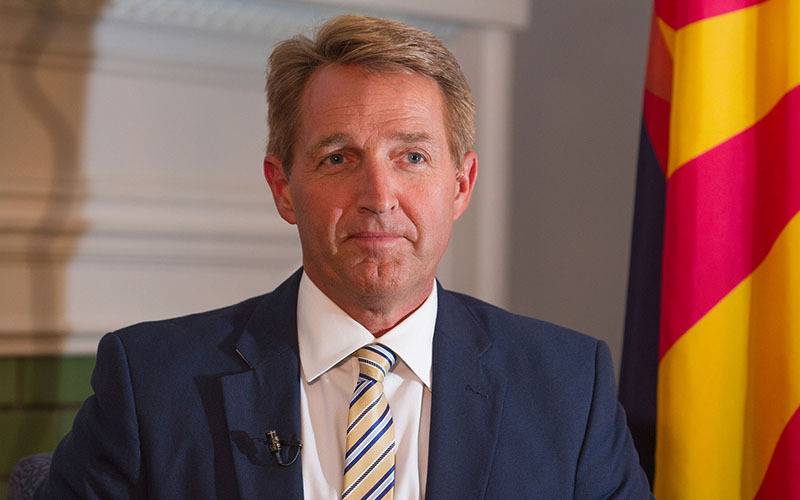 WASHINGTON – A reported White House plan that could give “Dreamers” a path to citizenship over 10 or more years will help those working toward an immigration reform compromise “a great deal,” Arizona Sen. Jeff Flake said Thursday. It’s a turnaround for the president and could remove one of the key sticking points that led to a partial government shutdown last weekend, when Senate Democrats refused to vote for a continuing budget resolution over the issue. Flake, in a speech Thursday to the U.S. Conference of Mayors, repeated his call for the Senate to take the lead on immigration reform and not wait for the White House. But in comments after the speech, he conceded that the president’s comments might aid his cause. “The president helped out those of us that want a citizenship deal, he helped out a great deal,” the Arizona Republican said, acknowledging that much work still needs to be done. Others were not optimistic that the president’s words would actually turn into administration policy. “It could be one of those situations that the president says something off the cuff that doesn’t end up being the administration’s final position,” said David Bier, an immigration policy analyst at the libertarian Cato Institute. Trump announced on Sept. 5 that he would phase out DACA, an Obama-era policy that deferred deportation for two years for young immigrants who were brought to this country illegally as children. About 800,000 people received DACA protection, which let them get work authorization, drive and go to school without fear of deportation. The coverage could be renewed by recipients who kept a clean record, among other requirements. But critics called the Obama policy an executive overreach. Trump said Sept. 5 that the government would stop accepting renewal applications and would start canceling protections March 5 – a six-month “wind down” that he said was meant to give Congress time to come up with another solution. There currently are about a dozen bills in Congress, sponsored by lawmakers from across the political spectrum. The bills vary significantly in eligibility requirements, conditions for remaining in the country and the time period “Dreamers” will have to wait before being eligible to apply for citizenship. None has advanced, however, in part because Senate leaders have looked to the White House to signal support any measure before it moved forward. But the president has wavered on his support, part of the fight that led to last week’s budget showdown. The shutdown ended Monday when Senate Majority Leader Mitch McConnell agreed to allow a DACA bill to move to the floor, with or without White House backing, in exchange for Democratic votes to extend the budget through Feb. 8. That gives lawmakers just two weeks to take action on DACA before another potential government shutdown. Flake said senators working on a deal are aiming to get 65 to 70 votes, which he thinks would be enough to sway both the president and the House to support a DACA fix. “If they can get 70 votes in the Senate, that will change my calculations from a 5 percent to a 10 percent shot,” Bier said.